Very often, when a congregation takes on the task of creating a new mission, it is the process more than the product that is most valuable. At the Main Line Unitarian Church (MLUC) in Devon, PA, the process proved to be not just valuable, but spectacular. Several months ago, the congregation began hosting listening groups in which members shared their hopes and dreams for the congregation and the values that were most important to them in being a part of their spiritual community. That information was carefully and lovingly crafted into a proposed mission and accompanying narrative by a Mission Task Force commissioned by the Board of Trustees. On Sunday, March 15th, “Mission Sunday” at MLUC, the proposed mission was unveiled with great fanfare (including a drum roll) at each of the two services. The presentation of the proposed mission was met with sustained applause by those in attendance. The actions of the Mission Task Force and the members of MLUC highlights the importance and the benefits of the mission process, a process that is not just a means to an end, but an end itself. In this case, a very happy ending. 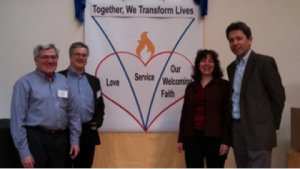 Mark Bernstein is a member of the Congregational Life Staff of the Central East Region of the UUA. He is on a mission to highlight successful mission processes in our UU congregations.